You've heard of the perfect storm, well this was the perfect lunch! A perfect bagel-wich vegan lunch. 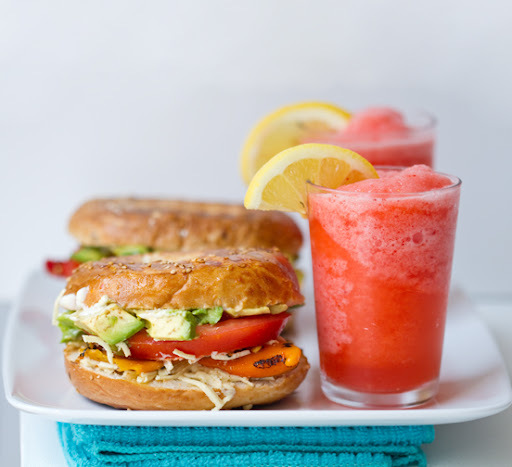 A panini-grilled bagel topped with roasted peppers, Daiya Cheese, tender avocado slices, a thick tomato slice, a swipe of Vegenaise and plenty of love. I served this crusty delicious bite with my Frosted Strawberry Lemonade. This was the perfect post-painting lunch for me on a sunny spring day. I love lunch time in spring. Iced tea, sandwiches, lemonade, picnics, sunshine. Get my bagel-wich recipe and have your own perfect storm - er - I mean lunch..
Well yesterday I finally broke out the old easel and started a new oil painting for the first time in over a year. I decided I wanted a bright yellow and green "V" image to hang in my kitchen. So I started. Not done yet, but when I finish I'll surely share. Now this lunch really hit the spot! (My dad always says that. Isn't it funny when you start sounding like your parents?) I used my trusty panini press to seal in all the yummy bagel-wich flavors. And my beloved Vitamix to whip up this frosty lemonade sip. Get my 3-ingredient Frosted Strawberry Lemonade recipe here. perfect lunch for a sunny day..
2. I like to toast my olive-oil-brushed sliced bagel on the panini press for a few minutes first before add the ingredients and fully "pressing" the bagel-wich. Note: you don't need a panini press - you can easily do this on your stove top or simply toast the bagel in your toaster - a toaster oven will easily melt the cheese. 3. Add the Vegenaise, avocado, peppers, pepper, tomato and cheese. 4. Toast until the bagel is toasty and the cheese lightly melted.